Now wait just a minute. I have some pretty sorry days! Things don't always go well for me! Some of my friends have abandoned me at my worst possible moments. 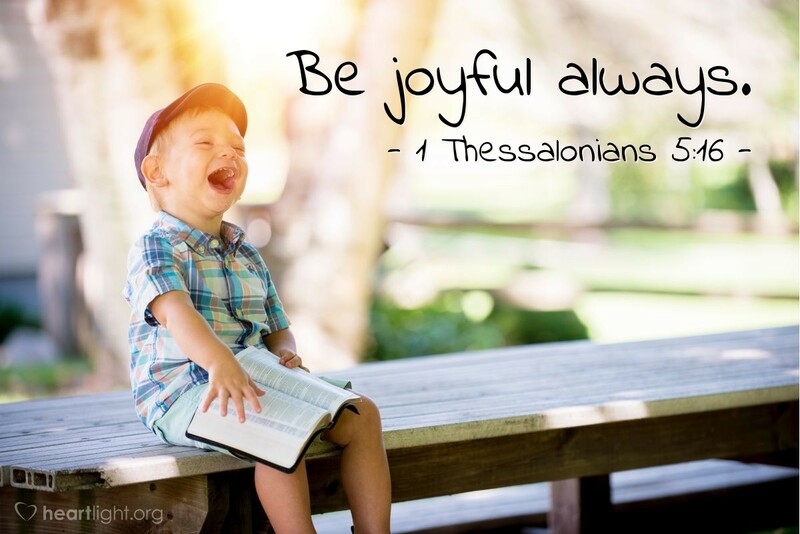 How can I be joyful ALWAYS? "Simple, my child," the Father reminds me. "First, joy is more than always feeling happy, but is instead, a deep abiding sense of being in God's grace and purpose. Second, no matter where you are, no matter how hopeless things may seem, your life is bound for glory — my glory!" In the light of this incredible truth, all other things seem bland, out of touch, and insignificant. O LORD, please give me a clearer sense of your glory and victory. Please empower my faith to trust the truth of your conquest over hell. Please fill me with your Spirit and bring forth your fruit in my life. Please fill my mouth with joyful praise for all that you have done for me. In Jesus' name I pray. Amen.